This scenario is taken from the By the Will of Our People... campaign supplement. It is fought when one player chooses the fighting retreat reaction when a battle is initiated against them. In this particular battle, Gothmog's forces were attacked by superior numbers. Not wanting to be destroyed in a pitched battle on the plains of Pelennor, he decided to fight a fighting retreat scenario. The defending player fields 1/4 of the points total of their army. The attacking players fields their entire attacking army. The board should be 4 feet by 4 feet. 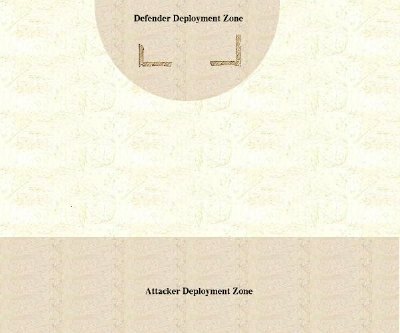 In the defending player's deployment zone there should be no more than 12 inches of barriers positioned by the defending player. Players may decide mutually on the surrounding terrain (and this should be influenced by the location of the battle). 5 Turns: The total retreating army is caught and slaughtered. Remove it from play. 10 Turns: 50% (points wise) of the retreating army is destroyed as chosen by losing player. 15 Turns: The retreating army is saved, those left behind to defend are all lost. 20+ turns: The entire retreating army survives; all soldiers lost to fighting make a full recovery and rejoin the retreating force. Damrod will avenge the death of Faramir! The tables have turned it seems! Time for Gondor to show the hordes of Sauron what it means to mess with the men of the west! This battle is pretty simple for me by way of tactics. I am just going to rush towards the enemy while blasting away with bows and ranged magic attacks. If I am really lucky and can take out all of the defending orcs before by turn five I could pull a major upset. If Gothmog's force gets wiped out here it could me some respite for my beleguered defenders of Gondor! The orcish captain resolves to push back the attackers! This is going to be a pretty crazy battle. When I decided to fight a fighting retreat I figured it would be easier to save my army this way than to actually fight a pitched battle against a foe with greater numbers. So, all I have to do is last 15 turns in order to do better than I'm sure I would in a pitched battle. Sure, Gothmog will go back to the Witch King with his tail between his legs, but at least his army will be (more-or-less) in tact. My plan is to set up my defenses as far away from the Gondorians as possible. I am not too worried about the bow fire from the Gondorians, as really it was basically a non-issue during the siege of Osgiliath battle. So, if I can keep the Gondorians from closing ranks on my soldiers for five turns, and then hold them at the barrier for ten I will be laughing! Once I get through this retribution will be swift! Damrod thrust his sword into the air to call for the charge of his troops. "For Gondor! For Faramir!" On they went, pressing forward with all their speed they made for the orcish lines. 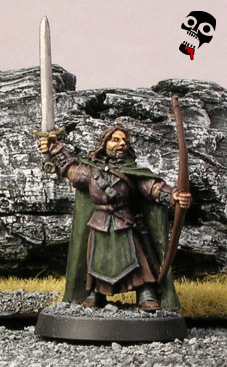 Damrod's rangers, along with the accompanying men of Gondor with bows let loose their arrows at the orcs, felling one. The orcs stood firm with their captain behind them waiting for the coming attackers. Again Damrod pushed the charge. "Onward for Faramir!" The men of Minas Tirith charged forward as those armed with bows darkened the sky with their arrows. The arrows of men flew true, no less than six orcs are felled by the archery of men. The rangers, with the help of the rest of the archers of Minas Tirith, fell six orcs! As Shadowfax tore towards the defending orcs, Gandalf lets fly with a blast of sorcery that claimed two orcs and knocked down one. The shattered remains of the felled orcs littered the battlefield. 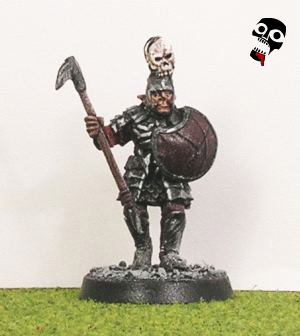 No less than nine orcs had been killed and battle has yet to be joined! Gragklac looked out at the host of men that approached and strengthened his resolve. If he could not hold these men, Gothmog's army may be destroyed. "We will taste the flesh of men tonight!" he called to rally his orcs. Unfortunately he knew that things did not look good. The despicable fortune of these men and their arrows had already reduced the numbers of orcs to below half. Still, Gragklac managed to hold them to the line even as the bows of men claimed one more orc and the magic of the white wizard shattered another of his defenders. With only himself and two orcs remaining on the field of battle, Gragklac called for a retreat. As he ran the arrows of men found their mark and Gragklac took a wound. Lukily for him, the hands of fate saw fit to keep him from feeling the wound! Gragklac also snickered at the white wizard's failed spell that merely knocked down one of his orcs! Perhaps Gragklac would taste the flesh of men yet! Damrod's war cry split the air as his men closed around the remaining two orcs. The orcs, having abandoned their defendable hill had no chance against the vengeful steel of the Gondorians. Both fell in the fighting, never to stand again. 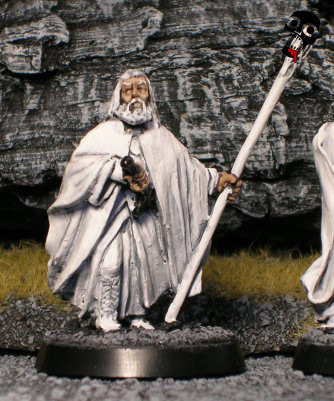 Gandalf called on the winds of magic to stop the orc captain in his tracks. The orc captain's will to fight the wizards magic was squashed, and he stood dumbfounded against Gandalf's charge. The force of Shadowfax knocked the orc captian to the ground, inflicting a grievious wound, but it was not enough to kill him! The orcs remained on the field of battle for another turn at least! Gandalf cursed fate, but resolved to slay the orc! Gandalf urged Shadowfax to charge the now fallen orc captain! With one fierce and powerful blow of his staff, the orc captain was finally dispatched, and not a single orc remained on the field of battle! The Valar have smiled on the world of men this day, for their victory in the defense of the Pelennor may have help save them from the hordes of Sauron! If only Gandalf was a better fighter... Perhaps he should have cast sorcerer's blast in turn five instead of charging into the fight... Still, I cannot really complain about the outcome of that battle! By killing all of the defenders by turn six I was able to destroy half of Gothmog's army, and I didn't even have to fight the entire army to do it! All of that and I didn't lose a single soldier! Faramir is avenged indeed! My archers were in top form as well, killing countless orcs! (actually, the archers killed eight orcs and wounded the orc captain, who saved the wound with fate). And when the battle was joined in the end, the men of the west came through again, killing the remaining two orcs with no trouble. Gandalf also performed extremely well. Thanks to his speed he was able to get into range with sorcerer's blast and take out no less than three orcs! He also ended up killing the orc captain and finishing the battle. I imagine the orcs of Mordor will think twice the next time they enter the fields of Pelennor! Aah! Gothmog returns to the Witch King with his tail between his legs indeed! His reckless and foolish advance into the Pelennor without the proper support from the rest of the forces of Mordor was foolish beyond reason, and he will have to atone for his errors with Sauron himself if he lives through this war! Really, I did a number of things wrong in this battle. I should have insisted on a wall instead of a defendable elevation! A wall would have likely prevented many orcs from dieing from bow fire! I probably should also have fielded some archers to pick away at the numbers of men as they advanced. Oh well, I still have the advantage, the world of men will still fall, but it may take a few extra turns thats all!